Rubstic, left, leads at the final fence before winning the 1979 National. Forty years ago Rubstic, from John Leadbetter’s stables at Denholm, near Hawick, became the first Scottish-trained horse to win the Grand National since the event began in 1839. 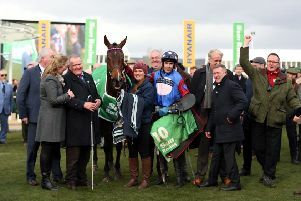 The historic success was especially remarkable given that the ten- year-old gelding was running in the National for the first time and, at odds of 25-1, was relatively unfancied, unlikely to encourage many to stake their life savings on it. Upping the ante, so to speak, jockey Maurice Barnes was making his debut in the race as were trainer Leadbetter and owner, the former Scottish and British Lions rugby international, John Douglas, pictured. From outside the rails this did not seem to add up to a winning combination but form had shown Rubstic to be a stayer who had never fallen and, as he cleared the final fence, he pulled away to clinch an unforgettable win by a length and a half. Cue for unrestrained delight among winning punters, mostly in the Borders. While the other main players may have had low-profile sporting pedigrees, the same could not be said about Douglas. Holder of 12 Scottish caps, mostly at No 8, between 1961 and 1963, he was also a black belt in judo and an accomplished heavyweight boxer, an East of Scotland champion. Arguably, his greatest achievement was selection for the British and Irish Lions to tour of South Africa in 1962, for four and a half months. Curiously, the seeds of his horse-racing enthusiasm were planted there during a childhood partly spent in Durban. During the early days of the Second World War, his father was ciphers officer to General Montgomery based in Palestine when Italy entered the conflict. As it was decreed unsafe for the family to travel back to the UK, instead they decamped to South Africa but not before a young Douglas had witnessed a cinema in Tel Aviv being blown up shortly after his family had left it. Thereafter, sailing through the Red Sea en route south, he recalled destroyers ahead, exploding spiked mines to facilitate their onward passage. Initially in Durban they lived near the seafront where his mother would take him and younger brother Jim for walks on the promenade beside which lay the racecourse where he enjoyed watching the horses, fuelling a lifelong interest. Back in Edinburgh, he attended Daniel Stewart’s College honing his rugby skills and also running a ‘book’ on the Grand National for schoolmates. “Not part of the curriculum,” he acknowledged. With his playing career winding down, he joined a syndicate led by fellow international Ian Robertson that bought a horse, naming it Rugby Special, which enjoyed five wins. Suitably encouraged, he bought Rubstic, “having liked the look of him,” for £1,300 from trainer Harry Bell of Hawick, initially placing him with Gordon Richards at Penrith. However, Rubstic experienced health problems there and Douglas was keen to move him. Although Leadbetter was relatively unknown as a trainer and had few winners on his CV, Douglas thought from inquiries he would be a good trainer to restore his horse to full health at his Bedrule stables. It proved an inspired choice as Leadbetter first gave him the tender care and affection necessary before building up his strength and stamina with runs up the hills at nearby Ruberslaw. Results on the course were good over long distances in the lead up to the National, at Sedgefield, Newcastle, Haydock and Ayr [second in the Scottish Grand National in 1978]. Engaging Maurice Barnes, another without a particularly successful track record, was the final piece of the jigsaw. Douglas recalled the celebrations. “ I hosted two parties that night at the Holiday Inn in Liverpool where I always stayed, one for those involved with Rubstic and another for friends.It was quite a night. Peter O’Sullevan, the celebrated commentator, was there. He used to take me out in the morning to watch the horses over the gallops. Meanwhile, back in Denholm, the next day Rubstic received a hero’s welcome amid a huge party on the village green. Most of the locals had bet on him and were enjoying celebrating their success. According to one: “It was like New Year all over again.” Bookies in Hawick ran out of cash after the race and many punters had to wait until Monday to collect their winnings. Since then only one other Scottish-trained horse, One for Arthur, has repeated Rubstic’s success, in 2017. On that occasion he was No 22 on the running list – incredibly, the same as Rubstic in 1979. Can Arthur overcome the odds Rubstic style for history to repeat itself on Saturday?